Krita 2.9 Beta 2 is Out! (Krita 2.9 beta 2, with a textured window background. Illustrations by David Revoy). Fixes and improvements with how actions and shortcuts are managed. This will help fix a lot of shortcut conflicts that existed in the past. Actions and functionality are smarter now as well. This means that buttons and menu items will be disabled/enabled when they are not available. (eg. You cannot change the canvas size if there is no documents open). Fix the layout of the filter and filter layer dialogs. Fix the opengl canvas for some (notably AMD drivers). More fixes coming up! Lots of warnings fixed that only show up with clang, quite a few of which unconvered real bugs. There are still 222 bugs at the moment, but quite a lot are rather minor. Lots and lots and lots of thanks to all the beta testers who have been sending in report after report! 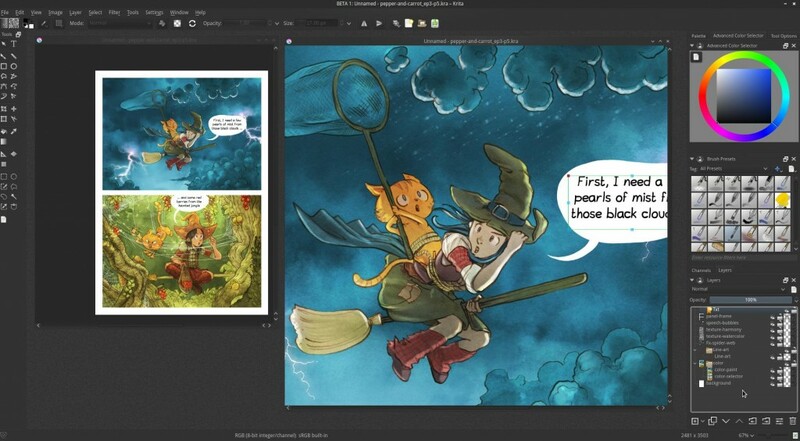 For Linux users, Krita Lime has been updated. Remember that launchpad is very strict about the versions of Ubuntu it supports. So the update is only available for 14.04 and up. There will be a third beta, and afterwards — the release!